Stuffed Cabbage leaves have the same basic ingredients as stuffed grape leaves except they use dry mint as a garnish and lots of lemon juice. They are easier to make than grape leaves too. Soak the rice in warm water for at least 30 minutes and set aside. With a knife separate the leaves from the cabbage head. Cut out the core and cut away the stems in the middle of each leaf. Bring a large pot to boil and then slowly dip the leaves into the boiling, salted waster until they are pliable. Place the pliable leaves in a cold water bath to stop the cooking stage. Drain the leaves. Prepare the rice by draining all the water off. Add in the salt, pepper, cinnamon, 1 tablespoon of oil, the meat, curry, and 1/2 Maggi cube (bouillon). Mix well. Cut the cabbage leaves into smaller sections and place enough rice mixture in the middle of each cabbage leaf. The rice should be laid like a small cigarette on the cabbage leaf. Fold the bottom of the cabbage leaf over the rice and then fold in one side only and roll up like a cigar. Place some blanched leaves of cabbage in the bottom of the pan. Start layering the cabbage leaves, putting the garlic cloves ever so often. 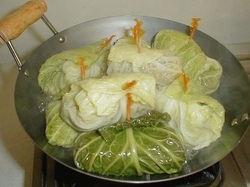 When you have finished the cabbage leaves, put a heavy plate or lid on top of the leaves so they do not move. Fill the pan with cold water to 1 inch past the lid. Add in 2 teaspoons of salt in the water. Cook the cabbage leaves for 1/2 hour and then add in the juice of 1/2 small lemon and the mint. Add enough water to continue to cook the cabbage until done. Drain the water and invert on to a platter. Serve with more lemon slices and sprinkle with some dried mint. The picture shows very thick leaves secured with a toothpick and this is not a traditional way to make them. The leaves should be thin and no need to secure.